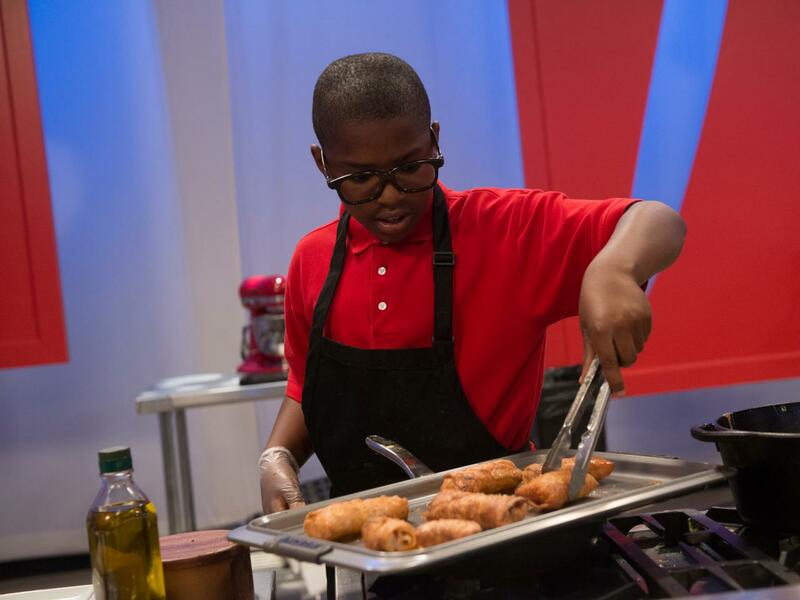 After a blindfolded taste test, the kid chefs must dream up a feast of food and animal mashups, inspired by the new movie Cloudy with a Chance of Meatballs 2. 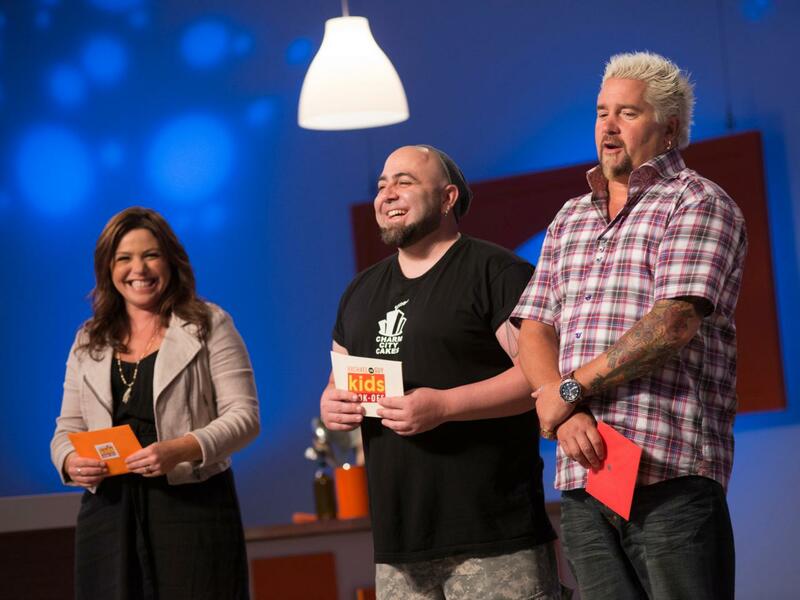 Guest judge Chef Duff Goldman will choose the winner. From Team Guy, Cole introduces his unique dish in an even more unique way. Meatballs in the oven and sauce on the stove may spell trouble for Jack. 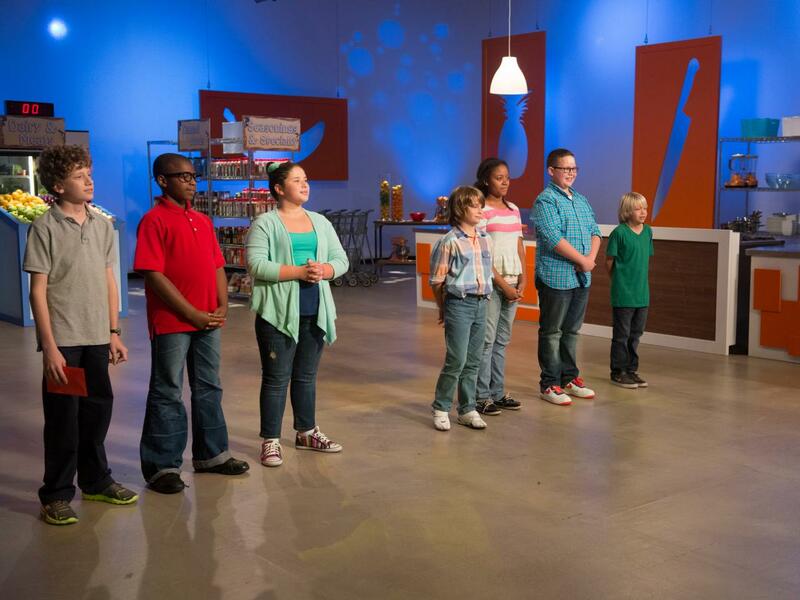 This week the kids will be tested on flavor combinations, which is "a key element to master," says Rachael. The Pop Quiz will be a blindfolded taste test, which the kids are scared of doing. It doesn't help that Guy asks if anyone of them is allergic to night crawlers! He calls up two kids, one from each team, to take the taste test side by side. 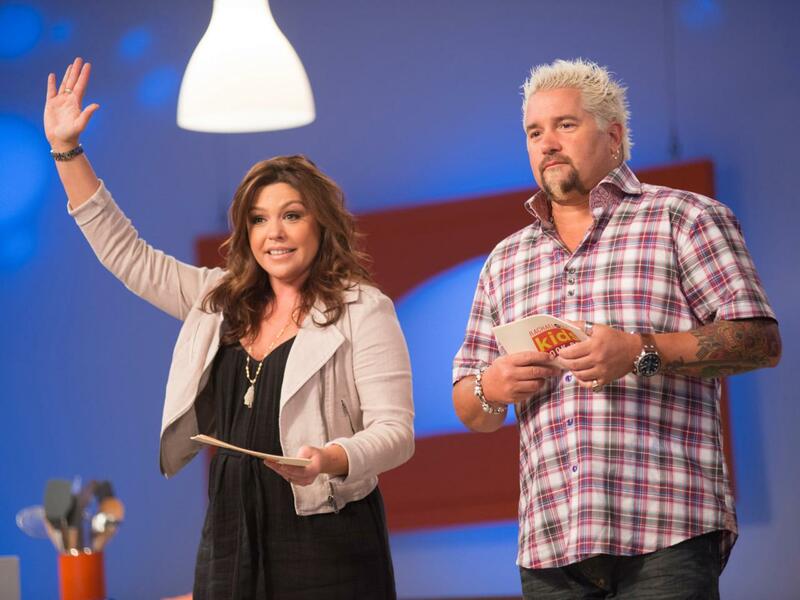 Photo By: Adam Rose ©2013 Television Food Network, G.P. All rights reserved. 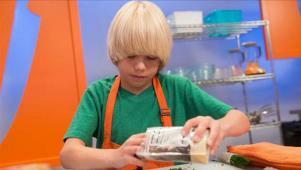 Hunter and Cole go first and taste the ingredients that are handed to them. Cole gets a bit queasy tasting food that's unknown to him and he can't even figure out what answers to write on his tablet. Only Hunter is able identify the avocado, but points are only given out if they can accurately identify both ingredients. 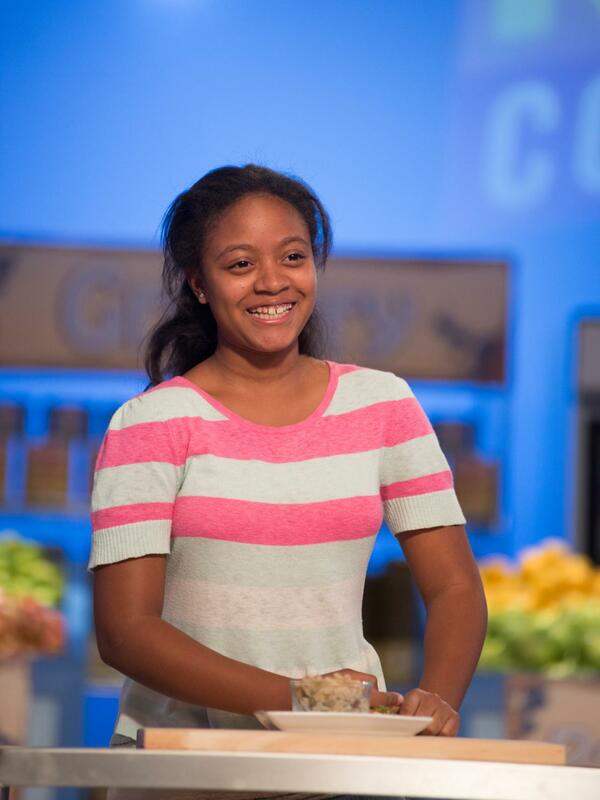 Neither Haile nor Sydney get both answers on the taste test correct, but at least Haile was half right with raisins. She couldn't think of the name for capers, so it was "salty, smooshy, small, circular" that she wrote on her tablet. Sydney isn't feeling all too well so she's not at the top of her game. 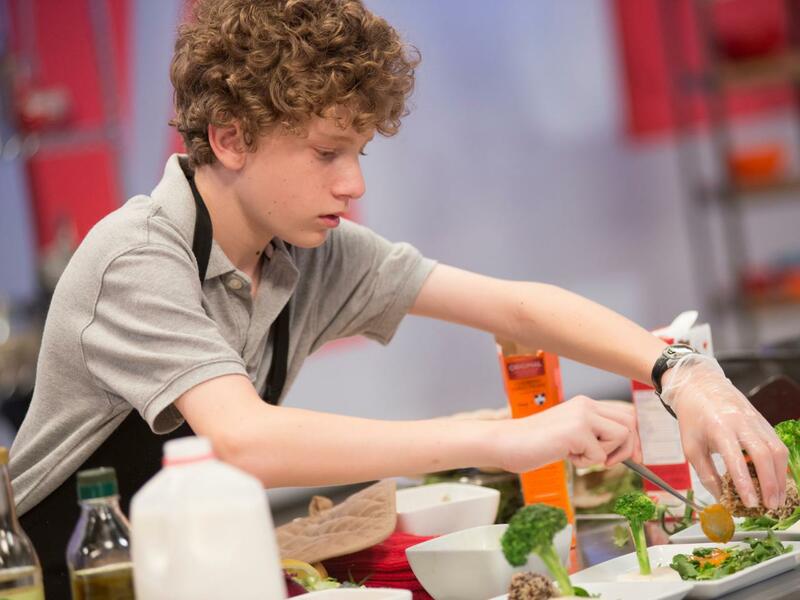 Jack guesses it's pineapple and horseradish, an ingredient in wasabi, and earns the first point for Team Rachael. Alessandra thinks it's wasabi and tangerine. 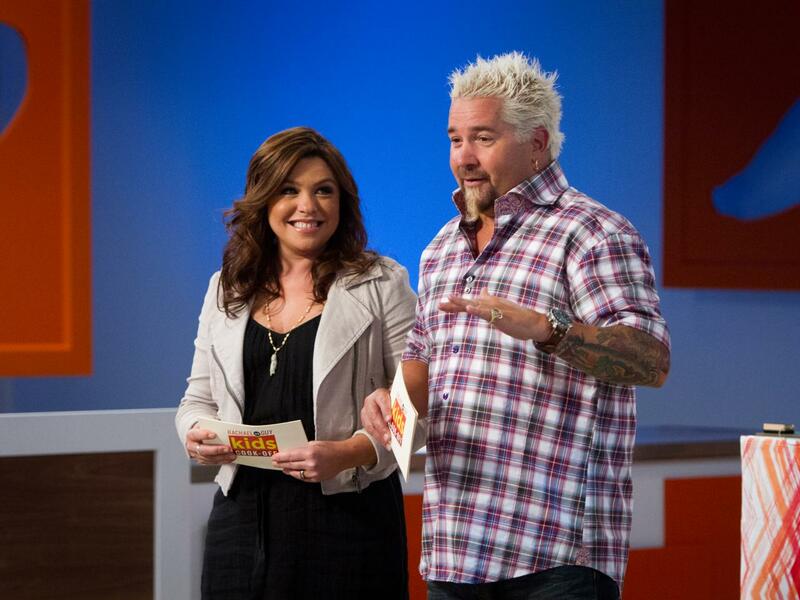 For Team Guy, Daniel ends up scoring 2 points when he correctly identifies two food pairings, breaking the tie. 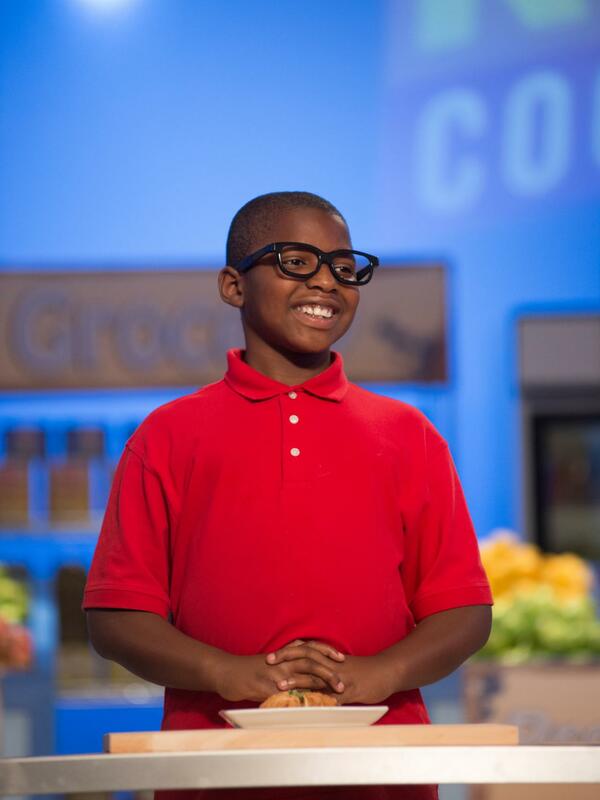 This time the kids are tasked with creating food mashups inspired by the movie Cloudy with a Chance of Meatballs 2. They will have 60 minutes to create four servings of their dish. The MVPs of the challenge will win a private screening to the movie for 50 guests. 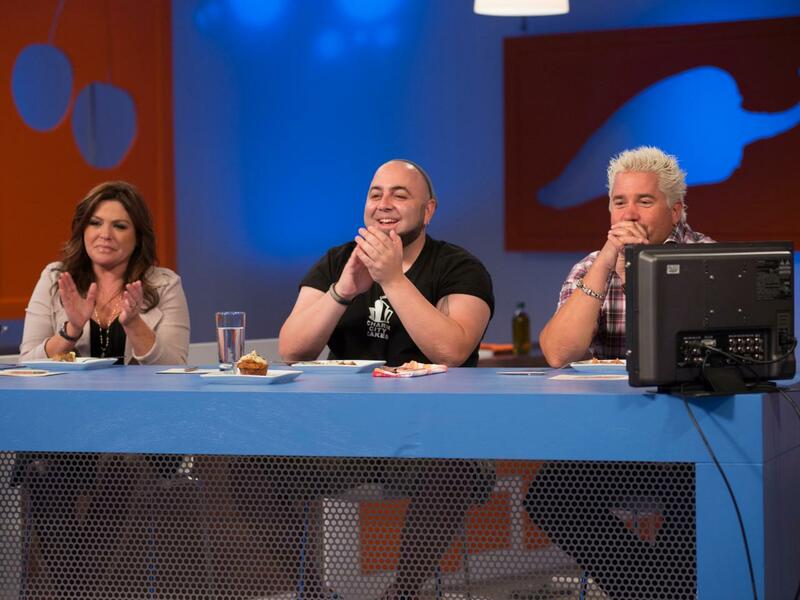 Duff Goldman from Food Network's Ace of Cakes will serve as judge. In the classroom the mentors hand out samplings of foods for the kids to try for inspiration before discussing their ideas for dishes. 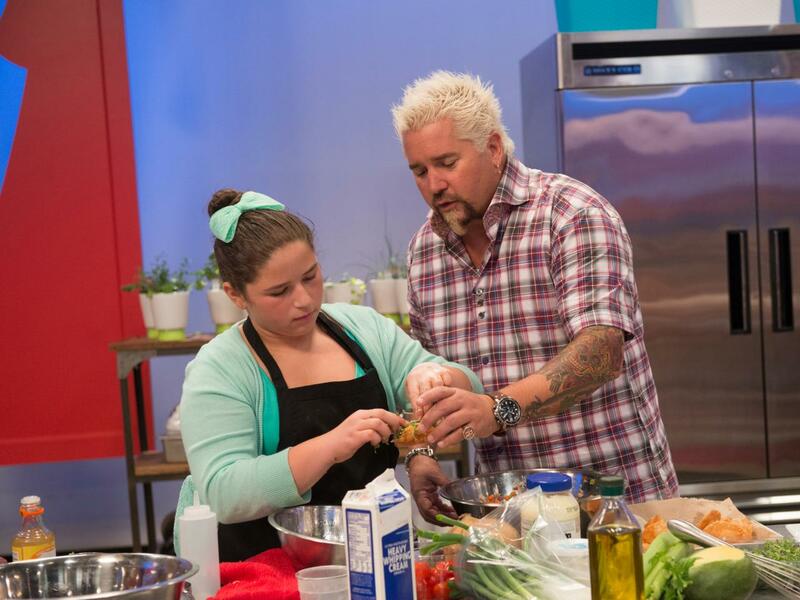 Unfortunately Sydney is not feeling well and won't be participating in the Cook-Off. 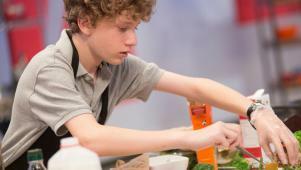 Hunter is creating a dish that he's calling larb shark swimming in Thai pesto. First he roasts the peppers, which will hold the meat filling, which will be a fusion of Italian and Asian. Here he whizzes up his pesto in the food processor. Unfortunately, halfway through the challenge Hunter burns his forehead, but he keeps on going without stopping. Jack is making peanut butter meatballs and jellyphants, which will be a jelly gravy for dipping the meatballs in. While making the sauce he loses track of the meatballs in the oven and overcooks them a bit, but there's no time to bake more of them so he has to go with what he's got. Haile is making fried rice pudding with garam masala. The dish will be a cross between sweet and savory that's packed with dried fruit and lots of spices. Rachael urges her to make her presentation fun, but joking around is outside of Haile's comfort zone. Brandon is creating meatloaf muffins topped with mashed potato frosting. Here he fills a piping bag with the mashed potatoes so he can create the frosted tops of the individual meatloaves. Guy steps in to give Alessandra tips on filling her crab wonton tacos with the mango salsa. Guy advised her to make sure the mango was a small dice, but Alessandra cut the pieces just a little too big and tries to go back and cut them up more. Daniel takes his pepperoni-chicken spring rolls out of the oven. He's serving them with a fire-roasted tomato sauce, which he unfortunately had to prepare twice because he forgot to roast the ingredients the first time around. But he finishes the dish just in time. 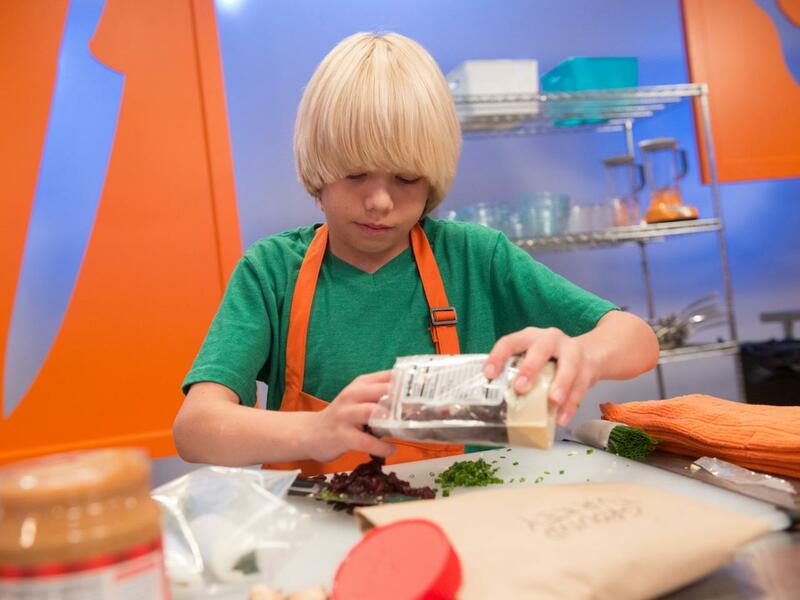 Cole works on completing his dish of porcupine meatballs on field greens. He creatively turns steamed broccoli spears into little trees on each plate by inserting them into pieces of jicama acting as little hills. 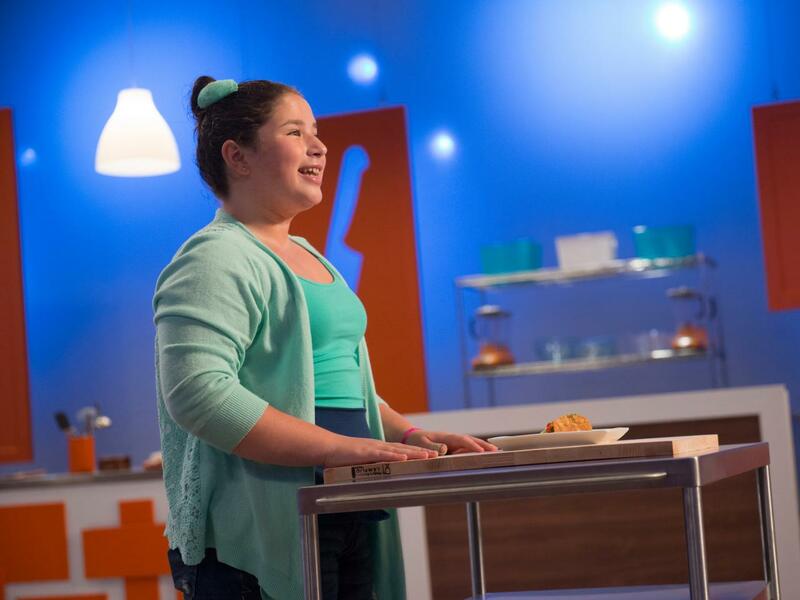 Rachael and Guy, joined by guest judge Duff Goldman, look on as each kid steps in front of the camera to present his or her dish, along with a story to explain the unique mashup of flavors and the imaginative idea that went into creating it. 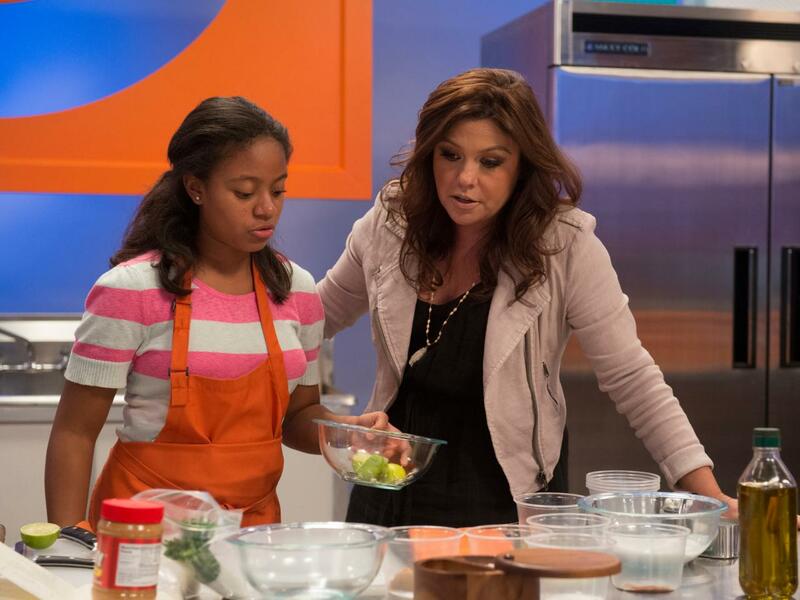 Rachael advises Haile to really play up the name of her dish and growl when pronouncing "garam." She stumbles a bit when trying to explain the ingredients of her fried rice pudding, but she ends up cracking herself up and Rachael is delighted to see a new side to her. Duff really likes the sweet-savory flavors of the dish. Jack presents his dish but he's flustered from knowing that he burned his meatballs so he has trouble keeping eye contact with the camera. But otherwise he gets through the presentation just fine. Even though the meatballs are dry, Duff likes the sweetness of the gravy. Alessandra comes out excited as ever, ready to present her dish. She offers a story to explain her crab tacos with mango salsa. 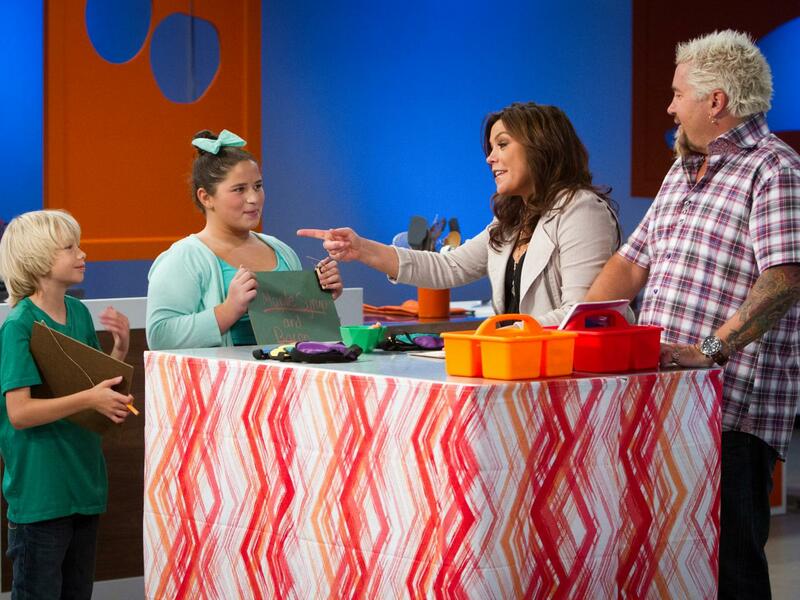 Duff calls her a mini Giada De Laurentiis and thinks that she nailed her presentation. And the flavors were great, but Guy still found the salsa not diced enough. Daniel comes in with the goal of just being himself and he does a great job presenting. Guy says it's his best camera presence yet and that he's grown so much since last week. Duff thinks his dish is very clever and well executed. The kids gather to hear the results from Rachael, Guy and Duff. They're commended for doing such a great job taking on the challenge of using the animated movie as inspiration for cooking unique dishes, with wonderfully playful results. It's time to announce the MVPs from each team. 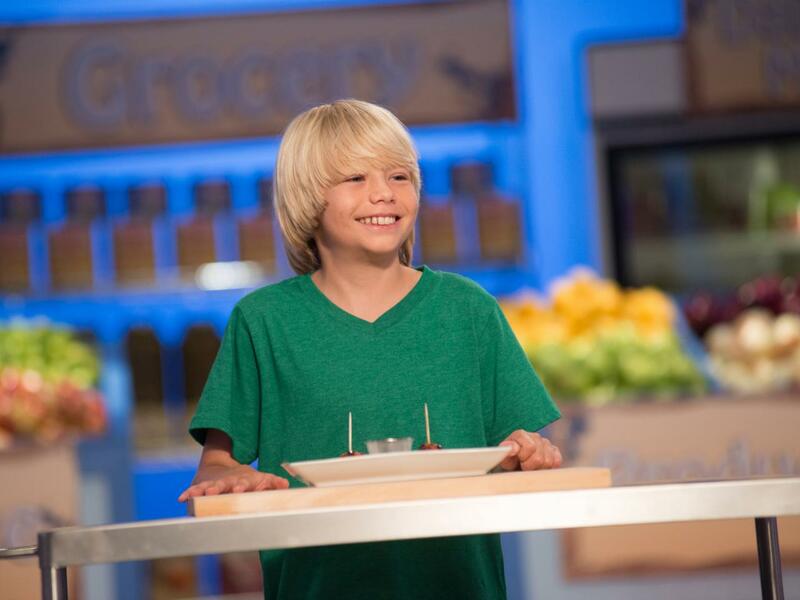 On Team Guy, Cole is the winner with 95 points for his porcupine meatballs. He had a great story to back up his inspiration with a quirky sense of humor that Duff compares to Alton Brown's. 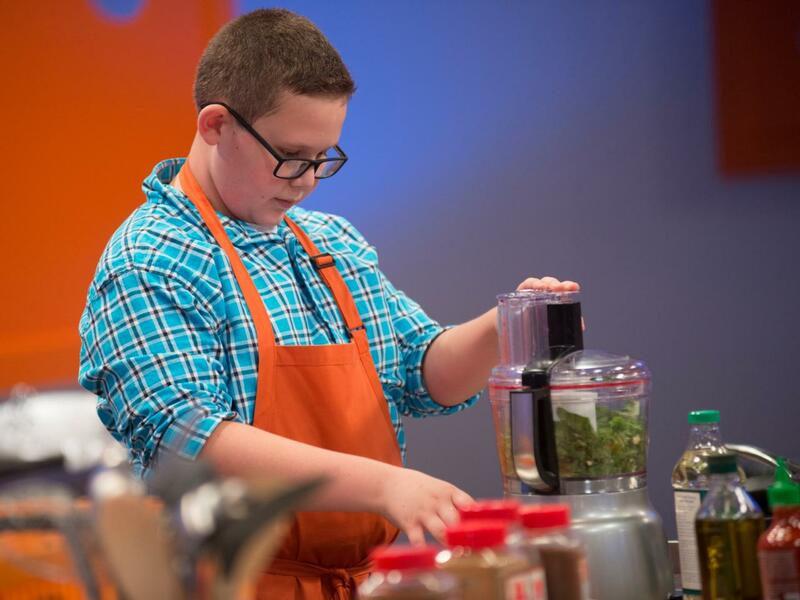 On Team Rachael, it's Hunter that scores the highest with a 96 for his flavorful larb shark that neither Duff nor Guy could get enough of. And even with a burn on his forehead, and now sporting a big bandage, Hunter soldiered through the challenge bravely and gave a great presentation, too. 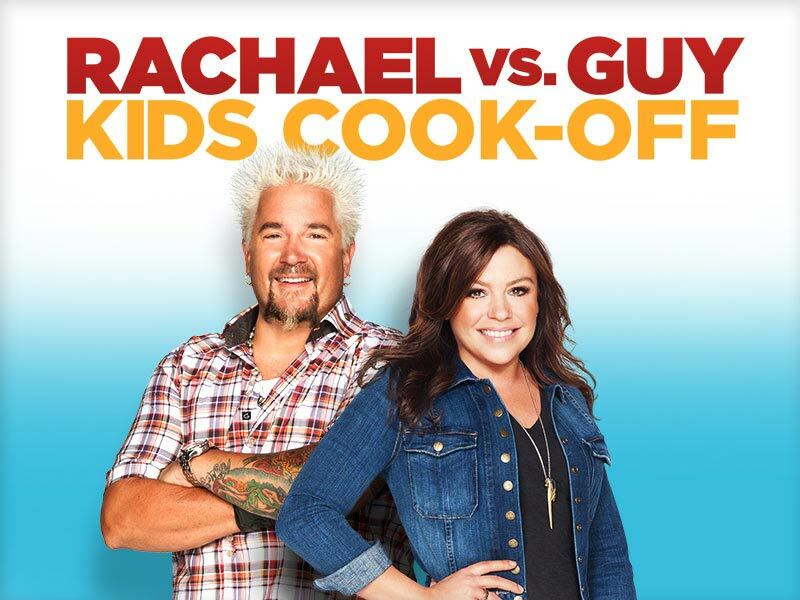 Visit the Rachael vs. 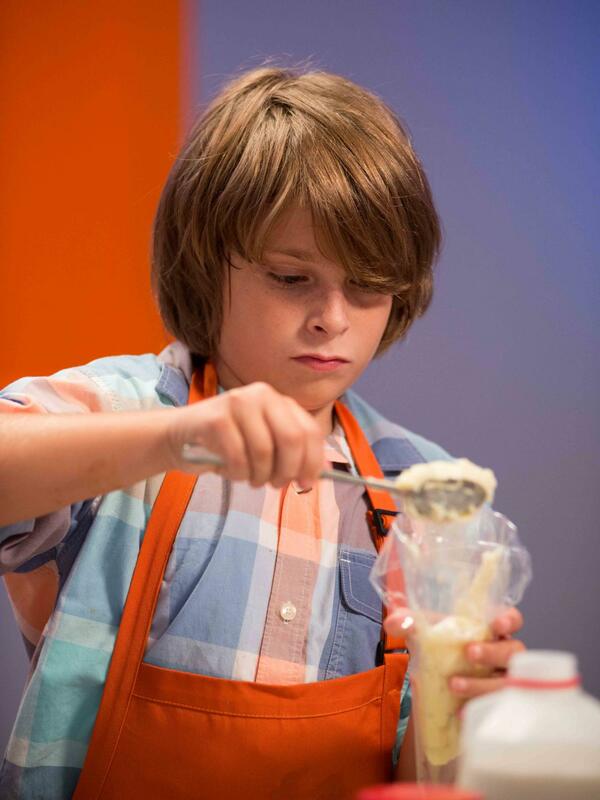 Guy: Kids Cook-Off page for more behind-the-scenes content.